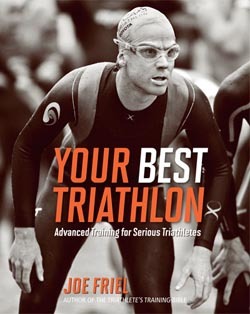 Joe Friel, the most trusted coach in the sport of triathlon, has written a new book for committed triathletes. Your Best Triathlon: Advanced Training for Serious Triathletes is a master plan for committed triathletes to achieve their best race ever. The book is now available in bookstores, triathlon and running shops, and online. To preview the book, please visit www.velopress.com. In Your Best Triathlon, Friel guides triathletes through every week of their season, outlining clear objectives and the guidelines to meet them. Friel reveals the highly refined training plans he has developed over his 30-year career coaching elite and age-group triathletes. He provides a tool kit of proven workouts that isolate and develop specific abilities. Hundreds of thousands of triathletes have relied on Joe Friel and his ground-breaking best-seller, The Triathlete's Training Bible. Now with Your Best Triathlon, Friel takes triathletes beyond the Bible and coaches them to their best performance ever. Triathletes using The Triathlete's Training Bible will create their own custom, self-coached training plan and use the book to learn everything they need for season after season of success in the sport. Triathletes who train using Your Best Triathlon will achieve breakthrough race performance by training the same way Joe Friel coaches his personal clients. In Your Best Triathlon, Friel defines the goals of each training phase and explains his strategies for achieving them. Triathletes will use Friel's training plans for sprint, Olympic, Ironman 70.3®, and Ironman® race distances and will master Friel's most effective workouts to improve specific abilities like endurance, economy, and muscular power. Within each workout and training plan, Friel offers simple modifications to better manage personal limiters. Your Best Triathlon adds depth and detail to the Training Bible approach, presenting relevant information at the right phase of training. Triathletes will refer to Your Best Triathlon throughout the season, just as they would check in with their coach. Your Best Triathlon offers all triathletes access to Joe Friel, one of the world's most experienced and respected triathlon coaches. Paperback with 2-color charts, tables, and illustrations throughout. Joe Friel is one of the world's most experienced and respected endurance sports coaches. He has over 30 years of experience coaching elite and age-group cyclists and triathletes. He is an elite-certified USA Triathlon and USA Cycling coach and holds a master's degree in exercise science. His training books The Triathlete's Training Bible, The Cyclist's Training Bible, Going Long, and Your First Triathlon are best-selling training resources in endurance sports. For more information, please visit www.trainingbible.com. VeloPress is an endurance sports and fitness publisher with books on cycling, triathlon, running, swimming, nutrition and diet, yoga, and the histories and personalities of our sports. VeloPress is the book-publishing division of Competitor Group, Inc., which publishes VeloNews, Triathlete, Inside Triathlon, and Competitor magazines and produces the Rock 'N' Roll marathon and half-marathon series, TriRock triathlon series, and the Muddy Buddy adventure race series. For more information, please visit www.velopress.com.